Super Bowl 50: Carolina Panthers Coach Ron Rivera Has Charlotte's Latino Community Fired Up Carolina Panthers coach Ron Rivera is the second Latino head coach in Super Bowl history. And Charlotte's Latino community is talking about football like never before. 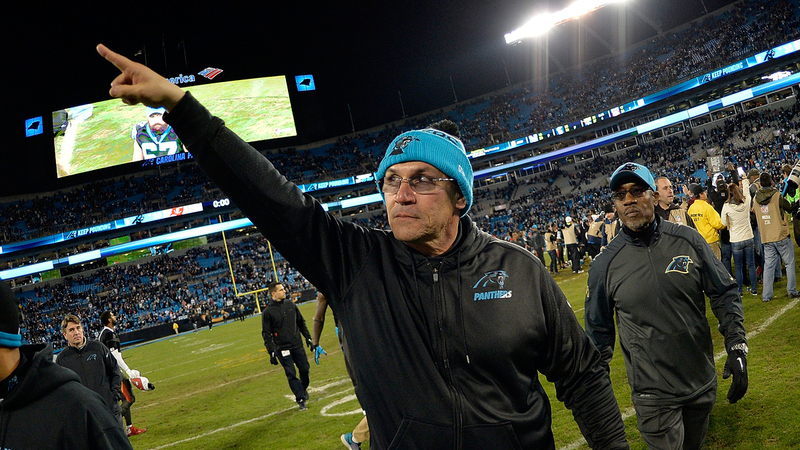 Carolina Panthers head coach Ron Rivera salutes the fans as he leaves the field after a win against the Tampa Bay Buccaneers on Jan. 3, 2016 in Charlotte, North Carolina. When the Carolina Panthers play the Denver Broncos in Super Bowl 50, Panthers coach Ron Rivera will become the second Latino head coach in Super Bowl history. And he's one reason why many in Charlotte's Latino community have become so enthusiastic about American football. Rivera says his interest in football started early. "Growing up, one of my role models was my uncle, who's half Mexican and half Filipino," he says. "Culturally, to be accepted, my uncles all grew up playing football and baseball and basketball." His father is Puerto Rican and his mother is Mexican. And Rivera is now part of an exhibit detailing how Latinos are changing the South, and vice versa. It's on display at the Levine Museum of the New South in Charlotte through October 2016. 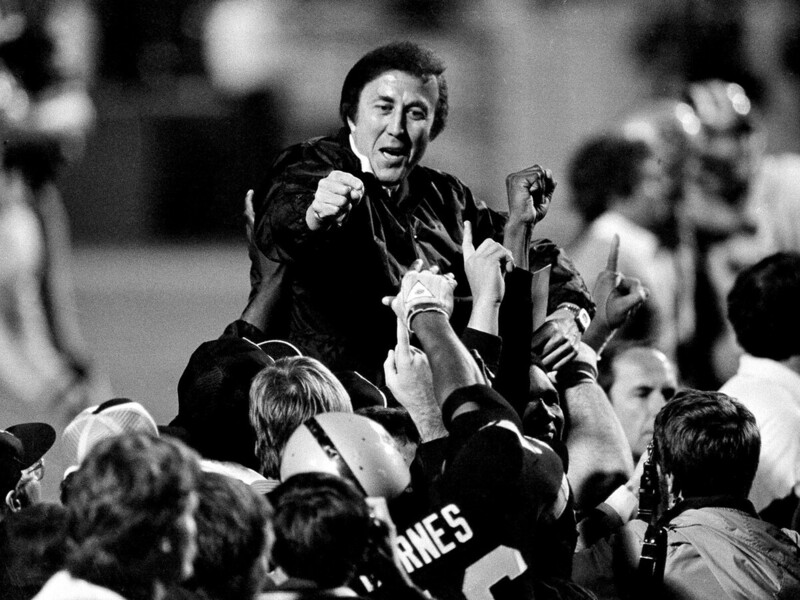 Coach Tom Flores gestures to members of the Los Angeles Raiders as they carry him off the field after their 38-9 victory over the Washington Redskins in Super Bowl XVIII in Tampa Jan. 23, 1984. In a museum video, Rivera says he loved football. He played in college and the pros. In 2011, the Carolina Panthers made him the third Latino head coach in NFL history. Rivera has a chance to become the second Latino head coach to win a Super Bowl, following Tom Flores' victory in Super Bowl XVIII with the Los Angeles Raiders. Oliver Merino, the Latino New South Coordinator at Levine Museum, says Rivera's story shows how the country is changing. "You have people that are coming from very different places and finding themselves here in the U.S.," he says. "[They're] incorporating their culture and their traditions and also embracing new ones." Hola Noticias, a local newspaper for the Hispanic community, has stepped up football coverage. Journalist Cesar Hurtado says as the Panthers pile up wins, more fans gravitate toward football. "Our community starts to understand the game, understand the players and start to love them. It's growing," he says. You can hear it too on Charlotte's Spanish-language radio stations. In years past, most callers wanted to talk soccer. With the Panthers' success, almost everyone now calls about football. Luis Moreno Sr. talks frequently about the Panthers on his daily sports show. "There's some people that they just like soccer, say you talk too much about football," he says. "I said well football is what it is right now, you know?" Jaime Moreno, Luis' brother, is a legendary Latino voice in Charlotte. He's the play-by-play announcer for the Panthers' Spanish-language broadcast crew. And Luis's son, Luis Moreno Jr., is the color commentator. They call games with the near-heart attack passion of World Cup soccer. In Ecuador, their broadcasts are how J.C. Alvarado's nephew follows the team. Alvarado is a local business owner and big Panthers fan. He's from Ecuador originally. When his nephew visited Charlotte in 2014, they went to Panthers practice. "Ron Rivera came out, and I just shouted, 'Hey Ron! I have an international visitor here for you!'" Alvarado says. "He actually stopped and came to us. We were like shocked. I didn't know what to say!" Alvarado says Rivera is a key reason why the Panthers are popular among Latinos. "I think he's a role model, not only for the Hispanic community, but for pretty much every person that wants to aspire to be somebody," Alvarado says. The way Rivera puts it, he's happy to let people know who he is and where he comes from. "I see myself as Latino. And I'm very proud of that fact," Rivera says. "And it's funny because people say you're a minority, you've gotten opportunities because you're a minority. I don't believe that for one second. I don't that believe you hire people because of their ethnicity. You hire people because they're the best." Sunday night, Rivera and the Panthers will be trying their hardest to take that title — the NFL's best.